I guess some recognise the handsome gentleman to the right, holding Olga too: My colleague and blog friend, TorAa. 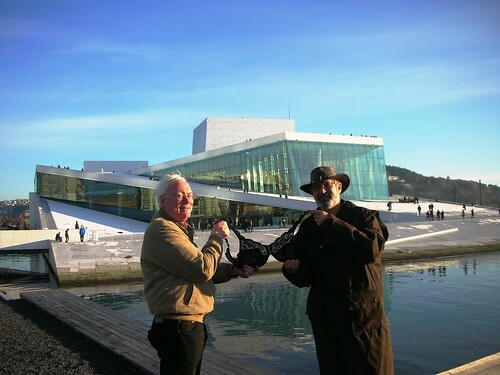 Opera and ballet are young art forms in Norway, art forms that evolve in an international setting. The Bjørvika Peninsula is part of a harbour city, historically the meeting point with the rest of the world. The dividing line between the ground ‘here’ and the water ‘there’ is both a real and a symbolic threshold. The production facilities of the Opera House are realized as a self contained, rationally planned ‘Factory’. This ‘Factory’ is both functional and flexible which was very important during the planning phase where a number of rooms and room groups were adjusted in collaboration with the end users. To achieve monumentality the architects wanted to make the Opera accessible in the widest possible sense, by laying out a ‘Carpet’ of horizontal and sloping surfaces on top of the building. This ‘Carpet’ has been given an articulated form, related to the cityscape. Monumentality is achieved through horizontal extension and not verticality. For the Opera House three main materials were specified at the competition entry. White stone for the ‘carpet’ (marble), timber for the ‘Wave Wall’ and metal for the ‘Factory’. As work continued glass was introduced, allowing the underside of the “carpet” to be visible. Left: Olga exploring. Right: An eager photographer. Oak was chosen as the dominating material symbolising the ‘Wave Wall’, which has a complex organic geometry made up of joined cone shapes, it has a light and varied surface. I do hope you enjoyed this exciting trip as much as Olga did. If so, go visit her and tell her in comments yourself! 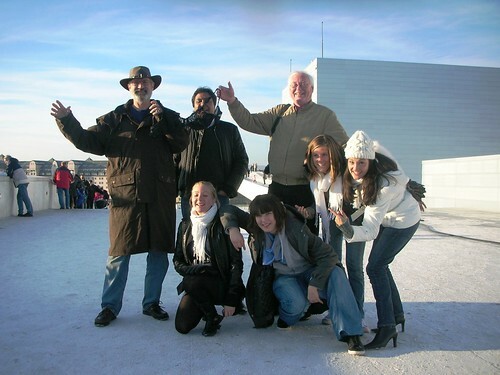 Well, that is an architectural treasure for sure and I’m happy that Olga had such good time – with sunny weather too! YEAY! I’m sure she loved walking around with two gentlemen at her side…. Yea; Olga and Opera is actually a perfect much – there is always sunny when Olga is around! Don’t forget to tell the world that I am the mysterious photographer behind the camera in MOST of the shots…but to be honest the roof was quite icy that day and I only came half way up before I decided it was madness…at least for me. It was however a lovely time and the Opera is exciting every time I visit! I’m so sorry Darling, I should of course remembered to mention my very best supporter! Nothing like a distinguished gentleman holding a bra in public. Nice Hat!!! So it excites you as well Eric? :lol: – Glad you finally saw my hat too!!! 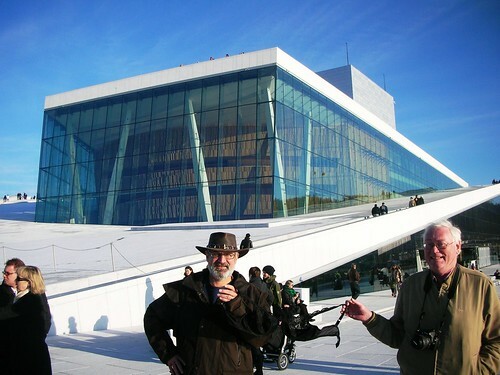 Good to know your not jealous then – hope one day to be able to show you around in Oslo too you know! Yea, Olga went crazy: jumping up and down, fooling around, meeting new people and of course loved to get close to Tor too! Looks like you, Tor, Olga and Diane had a lot of fun! Great pictures, although I must add, you look very cold! We had great fun and you know Tor: so nice and gentle. What a beautiful building. I’m sure it’s a great attraction. Olga seemed to enjoy it and hello to TorAa. So, does Olga REALLY have a passport and business cards? Too fun! It is – and even a greater attraction when Olga was there! Olga is fully equipped as a globetrotter you know! 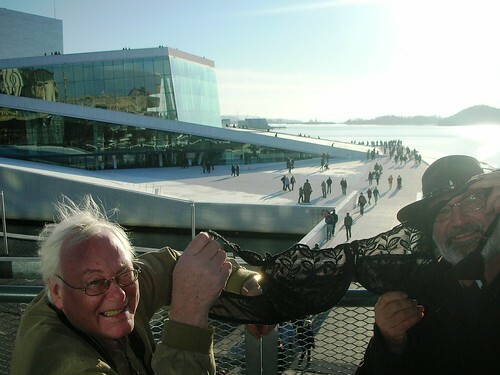 I can’t stop laughing while looking at pictures of the two gentlemen showing off a piece of women’s underwear in public ! There are many beautiful elements to this opera house – I’ll need to re-read this post again after I get some sleep ! It might seen a bit crazy, but Olga is very inspirational! Have a great weekend, Renny! Olga always keep us hot you know! Wishing you the same with a bunch of hugs back! Never too late you know! Really a beautiful piece of Art this building is.. the designers have done real justice to it provided its purpose was to show case Art. Glad you liked the Opera – I just love it. I must say, you look very Australian! It looks like you are wearing a traditional stockman’s coat and a dundee hat! lol. I watched the opening of the opera house on TV and there was this famous comedian/musician (I don’t know her name but I think she had her own music TV show) and she did a skit on what singing at the opera house would be like in a hundred years thanks to global warming – with a mouth full of water she gargled opera. :D very funny. I have been in Australia you know and the outfit is very useful in Norway too! I was just thinking that (Renny looking Australian). If I didn’t blog and knew about Olga – I’m not sure what I would do if 2 men had to walk up to me and ask to have a picture taken with them and Olga. So I’m pretty impressed that people are so cool about it. Glad blogging has opened your mind then – everything for a good course you know – after a while and some explanation, they where all very keep. You two guys were really having fun with Olga. It shows in the photos. That Opera House looks so interesting. I’m so interested in seeing that Opera House. The design is indeed quite different. I guess pictures says more than a thousand word. Your always welcome to visit – I’ll gladly show you around like with Olga. I couldn’t believe my eyes, seeing you holding up the bra! hehe… and TorAa! So sporting, you two fun guys! I was looking for a lady called Olga… hahaha…..
Knowing me, I did not expect you to be that surprised. By all means: Olga is a Lady! Wow, Olga does get around. Shouldn’t she have a coat on….it looks cold there. BTW, this post has been linked at SlogBite. I think it would be a shame dressing her up. Besides she’s too hot! Btw: I know – SlogBite is so supportive and love good stories you know. Your friends Ginnie and Mel took the words right out of my mouth! I’m so glad you all had such fun! The architecture you’ve shown here is amazing!! Olga is very sophisticated you know and love pieces of art! Oh Renny I am trying very hard to concentrate on the lovely Opera house. But, I can’t stop laughing. You are doing a terrific job. Olga is certainly have a grand time. Please don’t worry that the other people thought you were out of your mind. All of us Olga OOglers understand!! Great to meet Olga OOglers and glad you have a proof of that’s she is doing just great. I just want to say that Renny is not only a GREAT tour guide and Chaperon, but a true gentleman! Renny – I think you really do understand me AND my mission….we make an excellent team! Thanks Olga, what a compliment. I’m blushing and that’s the first time…… in front of you! I do understand your mission and it fits perfect to mine too…. we’re nothing but a smashing team! What a cool building, Renny. No small wonder that it won numerous awards. Glad you liked it Deborah – I’m thinking the same. Wish you a wonderful one too! oh i love the design of the building. so simple yet elegant! don’t pull the bra too hard… it’ll snap! LOL! Looks like you are still having fun with Olga! And great to see Tor joining in on the fun! we had a wonderful Sunny Day in Oslo. Only 2 persons missing: The real owner of the BRA and Anna (she had too much to aftere our Womens Party the evening before). The Photos is excellent. It’s great history. 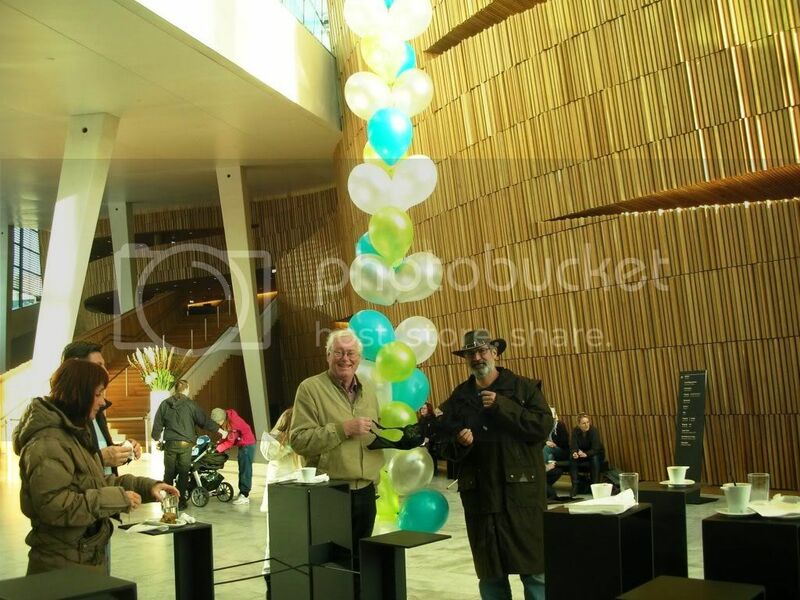 See you and Diane soon, both as Speaker and Guests on the cruiseliner from Oslo to Kiel. ROFL! This is your best tour yet with Olga! I just had a HAT contest. YOU were there. 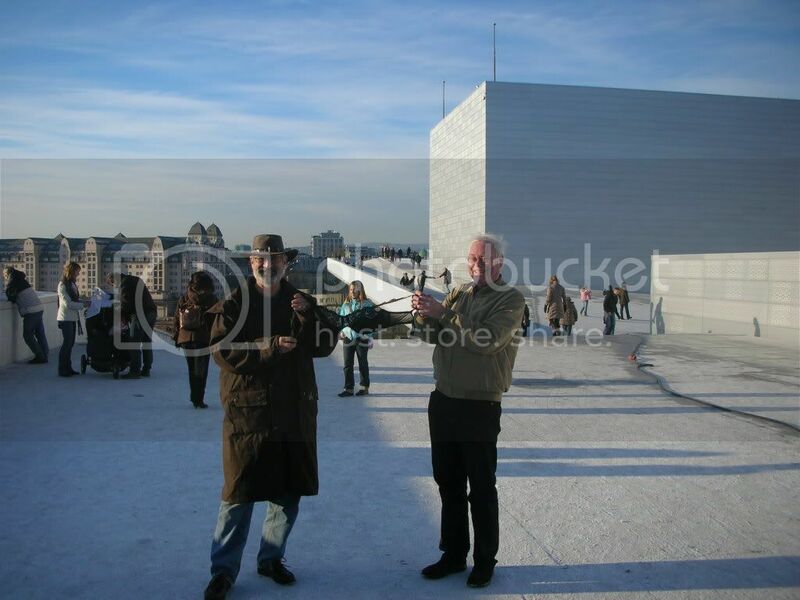 I never saw oslo opera house before … a magnificent building …The government wanted the Opera House to be a landmark for Norway as a cultural nation .. I would dearly love to have seen the expressions on the faces of passers-by! 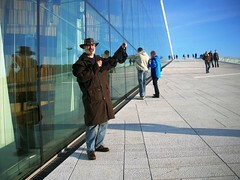 this is my second visit at the Opera house on Terella and I begin to know very well Oslo!!! What a nice weather you had! Here we had a lot of rain this time. Today it was a little better.Love your hat and coat! sounds you had all good time with the Bra! 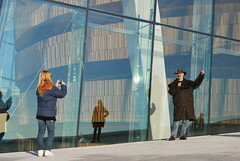 in the Oslo Opera House pool in flickr. Looks like you guys enjoyed yourselves a lot! Beautiful blue skies too.